I don't really know how this ended up in my Youtube recommended list, but somehow it did. It was shocking news, because we know we should treat birds of all shapes and sizes with tender love and care. Whenever I see a bird, I stroke it gently to show my affection, giving it a good ol' pat on the head as it stands up (and chirps) in excitement. Unbearable was the heartache when I saw the graphics of hundreds of birdies stiff and hard. I knew right there and then I had to click on the thumbnail to learn more about the demise of these poor creatures. Of course, I am conversant in microwave communications (being an electronics engineer) and debunked a once spreading rumor that China was controlling the climate through microwave signals, targeting adjacent countries over a feud on the Spratlys group of islands ( see https://www.eememes.com/2013/11/microwave-generated-tropical-typhoons.html). After watching the video, my skepticism was raised yet again. I did a quick fact check on the protocols governing 5G, did the math on the maximum frequency range based off wikipedia, and the numbers came nowhere close to values that were pernicious to living organisms. The thing about frequency is that it takes so much power to generate at higher ends of the spectrum given that the amplitude remains constant, and the fact that it attenuates faster the farther the distance depending on terrain and climate. This happens to be one of the challenges the 5G developers had to work on, the very limited area it can support due to the latter. 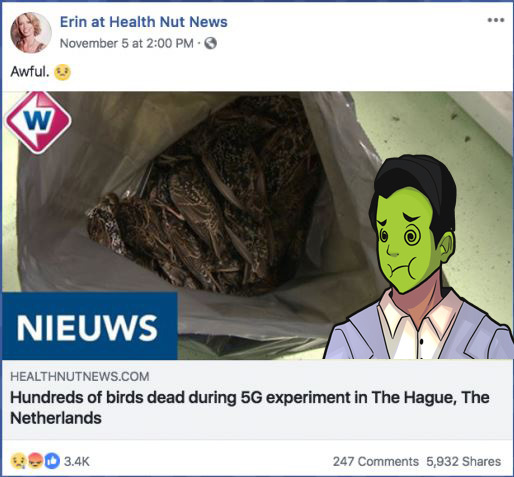 Thus, my sympathy for the birds turned into sympathy for the unknowing viewers who would chance upon this misleading fake news. To my dismay and umbrage, the comments section proved my worst fears to be true. Warning: The following can cause sever agitation and stress to the initiated in radio communications. You have been warned. I hope no one would be audacious enough to take down or destroy the 5G cell towers when they are deployed. From the comments, we see the disorienting effects false information can have when propagated to an unknowing public. There is nothing I can personally do to impede the spread of such news, but write an article about it and condemn it as a huge pile of junk!! !